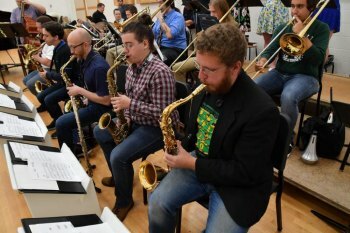 Marshall University, in partnership with the Nu Jazz Agency, will host the inaugural Huntington International Jazz Festival (huntingtonjazzfest.org) June 19-23 in Huntington, in conjunction with the Marsalis International Jazz Piano Competition June 22-23 on the Huntington campus. The five-day jazz festival will include everything from jazz performances to a family-friendly street festival to a jazz-related exhibit at the Huntington Museum of Art. It will feature community activities for people of all ages, appealing not only to jazz aficionados but to lovers of music, art and literature. The activities will culminate with two back-to-back nights of historical performances from the Marsalis Family Quintet, Arturo O’Farrill and the O’Farrill Family Quartet, and Jon Batiste of the Stephen Colbert Show. For a full schedule, visit www.marshall.edu/music/jazz.